Forget Something? It’s Black Friday! You’ve got your list, and you’ve checked it twice! Black Friday Amazon Smile Gift Guide & Deals! This Friday we hope that you consider shopping with our Amazon Smile store to bring joy to your favorite first responder and or loved one this year. We've hand picked a few deals to help get you started and we've covered just about every budget. Bring relief to a bad back with this back massager. Naipo Lower Back Massager with 3D Shiatsu Kneading and Heat for Car, Home and Office Use . A new Amazon Fire tablet is perfect for those wanting to get on board with tablet. This one comes Alexa enabled. All-New Fire HD 10 Tablet with Alexa Hands-Free, 10.1" 1080p Full HD Display, 32 GB, Black - with Special Offers. Looking to get fit in 2018? Or just looking track your activity. This fitness tracker is compatible for both Android and Apple iOS! Waterproof Bluetooth Smart Wristband Heart Rate Monitor Fitness Tracker Wristband for Android and IOS Smart Phone , Silicone wristband, Calorie and Step Counter, Call Notification for Android iOS. Maybe you are looking to maintain this year and need to check your weight. This smart scaled is sure to do the job as it connects to your phone or smart device for easy tracking. Dr.meter Digital Weight Bathroom Scale with IOS and Android App Smart Body Monitor for Body weight, Body Fat, Water, Muscle Mass, BMI, BMR, Bone Mass and Visceral Fat. Are you, a friend or loved one always low on juice? What a pain! Bring relief with this portable high powered and fast portable charging battery pack. Portable Charger iClever 15000mAh Power Bank with 4.8A Dual USB Output and 2A Lightning & Micro Input, SmartID Technology External Battery for iPhone, iPad, Samsung Galaxy and More. This new rescue car tool combines escape window hammer, seatbelt cutter, bright torch, work light, warning light, portable charger. Everything you need to save your life in an emergency is available in this compact car safety kit. iMagitek Rechargeable Multi-Functional Emergency Life Saving Kit with Escape Hammer, Seatbelt Cutter, LED Flashlight, Work Light, SOS Warning Light, Portable Charger for Car/Camping/Hiking/Hurricane. Got a little and need to monitor your loved one? Or do you just need to keep on eye on your property? This handy monitor/surveillance tool is at an ideal price point. Be sure to use promo code: 323OXZ6B. DBPOWER Digital Video Recorder Baby Monitor System with 4.3-Inch Color LCD Screen, Remote Camera Pan-Tilt-Zoom, Lullaby, Night Vision, Two Way Audio and Recording, Includes Compatible Mount Shelf. Both of these handy jump starter kits are sure to put a smile on someones face. You might even have to share what a steal they were when they open on Christmas day! Or one for yourself to save a call to Triple A. 1. DBPOWER 1200A Peak Portable Car Jump Starter (for 6.5L Gas, 5.2L Diesel Engine and more), Car Battery Booster Pack & Charger, Power Bank Phone Charger with QC3.0 Built-in LED Emergency Flashlight. 2. DBPOWER 500A 10800mAh Portable Car Jump Starter (up to 3.0L Gas/ 2.0L Diesel Engine), Emergency Battery Booster Pack, Power Bank Portable Charger with QC3.0, Type-C Output, LED Flashlight with 3 Modes. On a budget? One of these handy Dashboard Phone mounts will keep your text message loving loved one happy. Tsumbay KKA92001 HUD Simulating Design Car Phone Holder/Universal Cradle Adjustable Dashboard Phone Mount for Safe Driving for iPhone 7/7 Plus/6S/6/5S/5C, Samsung Galaxy S7/S6 and Other Smartphone. For the avid outdoor enthusiast this emergency flash light will bring light to life. At a price you can't beat. MECO Hand Cranking Solar Powered Rechargeable Flashlight Emergency LED Flashlight Carabiner Dynamo w/ Quick Snap Clip Backpack Flashlight Torch Weather Ready for Camping Outdoor Climbing Hiking. This gift work wonders for the senses and is sure to bring pleasure to the olfactory system. We recommend a few drops of lavender before bedtime. It's even got auto-shut off! Go crazy with the essential oils cuz lavender is included in this value driven oil kit. 9 oils! Plus a free e-Book with recipes. Natrogix Bliss Essential Oils - Top 9 Therapeutic Grade 100% Pure Essential Oil Set (Tea Tree, Lavender, Eucalyptus, Frankincense, Lemongrass, Lemon, Rosemary, Orange, Peppermint) w/ Free E-Book. 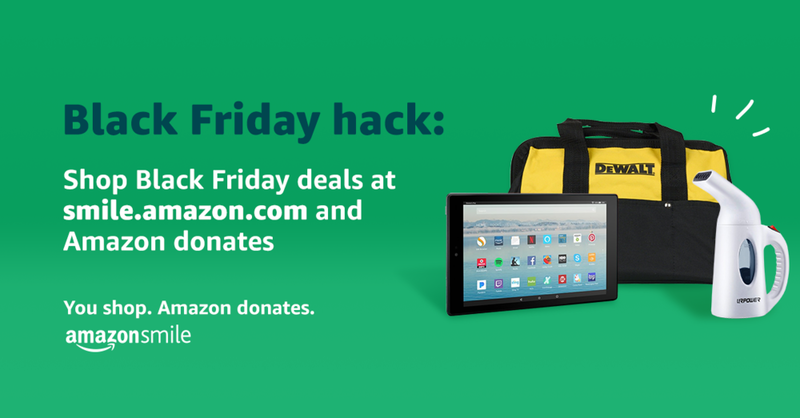 There plenty of deals to be had this Friday but only the ones you purchase through our Amazon Smile portal will directly contribute to the Memorial Foundation. Enjoy and we wish you a happy and safe Thanksgiving holiday.